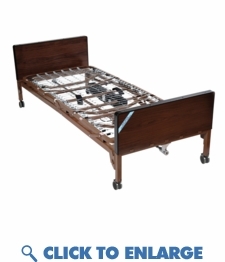 This full electric Lite hospital bed frame is ideal for home use. The lightest beds with a great warranty. Lite series hospital beds reduce the risk of back injuries or property damage because they are among the lightest home care beds in the industry. Remote control allows you to easily adjust the height of the bed frame including the head and foot area for patient comfort. Lite Beds feature premium Linak™ motors that provide smooth reliable operation for years. Recessed headspring supports and foot assembly reduce the chance of pinching and injuries. Lightweight beds make transporting easier. This is the industries lightest beds making transport and storage much easier. The Lite hospital bed weighs only 169 lbs and supports up to 450 lbs. Strong beds have an extra steel plate welded to the middle of the frame ensuring strong and stable support. Painted frame have 3 coats of enamel finish and clear coat for a chip and scratch-resistant finish Durable plastic wood grain end panels resist breakage and moisture. These Lite hospital beds can be cleaned without having to remove the motor. The electronics can be washed with standard water pressure. End panels are easy to wipe down to keep clean. Easy to Assemble, the hospital bed has 4 smooth rolling casters (2 locking) making it easy to move. Optional Full and or Half Side Rails Available Optional Therapeutic Foam Mattress Available to prevent and heal up to stage 2 bedsores. This full electric Lite hospital bed frame is ideal for home use. The lightest beds with a great warranty. Lite series hospital beds reduce the risk of back injuries or property damage because they are among the lightest home care beds in the industry. Remote control allows you to easily adjust the height of the bed frame including the head and foot area for patient comfort. Lite Beds feature premium Linak™ motors that provide smooth reliable operation for years. Lightweight beds make transporting easier. This is the industries lightest beds making transport and storage much easier. The Lite hospital bed weighs only 169 lbs and supports up to 450 lbs. Strong beds have an extra steel plate welded to the middle of the frame ensuring strong and stable support. Durable plastic wood grain end panels resist breakage and moisture. These Lite hospital beds can be cleaned without having to remove the motor. The electronics can be washed with standard water pressure. End panels are easy to wipe down to keep clean. Easy to Assemble, the hospital bed has 4 smooth rolling casters (2 locking) making it easy to move. Optional Therapeutic Foam Mattress Available to prevent and heal up to stage 2 bedsores. Bed, side rails and mattress safety-tested by SGS, a nationally recognized testing facility. In the event of a power failure, a 9 volt battery, located in the hand control, can lower the head and foot sections nine times. New and improved hand pendant has large, easy-to-use controls. (Figure E) Bed ships in two cartons. Extension kit available extends length from 80" to 84". Bed Height Minimum Without Casters	12.75"
Bed Height Maximum With Casters	24"
Carton Shipping Weight	182 lbs.